It might be an oldie, but boy is it a goodie. 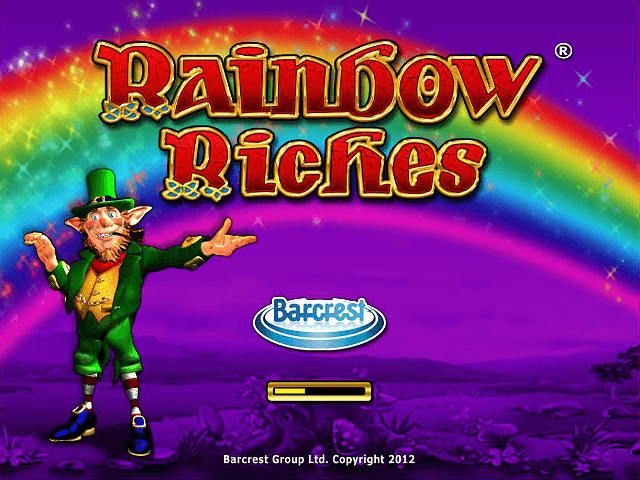 The Rainbow Riches online slot from Barcrest is the template to which many games aspire, with its lucrative pay-outs and straightforward but fun gameplay. It might look old school if you're new to the world of slot gaming, but the £200,000 prize is bang up to date! Toeing the line between style and substance, the Rainbow Riches slot machine shows that simple can be oh-so effective. Play Rainbow Riches for Real Money! Opt-in required. 18+ only. New customers only. First two deposits only. Maximum bonus is £250, + 100 bonus spins. Bonus spins valid on select slots. Wagering req 45x Bonus Amount. Max bet £5 per bet. Max conversion £1,000. Neteller / Skrill deposits not permitted. Bonuses expires after 7 days. WinStar was released in 2018 with big expectations, given the casino is technically a spin off of the huge land-based WinStar World Casino and Resort in Oklahoma. WinStar casino features the brand's famous logo, but this UK version is its own animal when it comes to a fresh and stylish vibe. Yep, only seven main game symbols are up for grabs, but there are two more icons that will appear and these have some special powers. 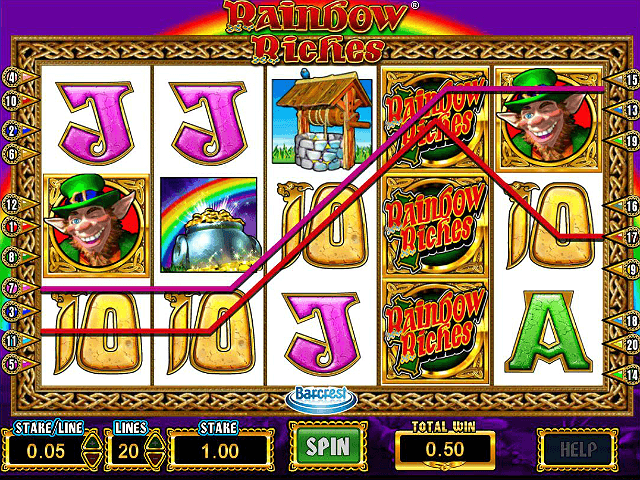 The great thing about the Rainbow Riches online slot is that it can be edited to your preferences. You can play with one payline, all 20 or any number in between, and bet per line amounts can range from 0.01 to 20.00. Just use the relevant arrows to set your parameters. 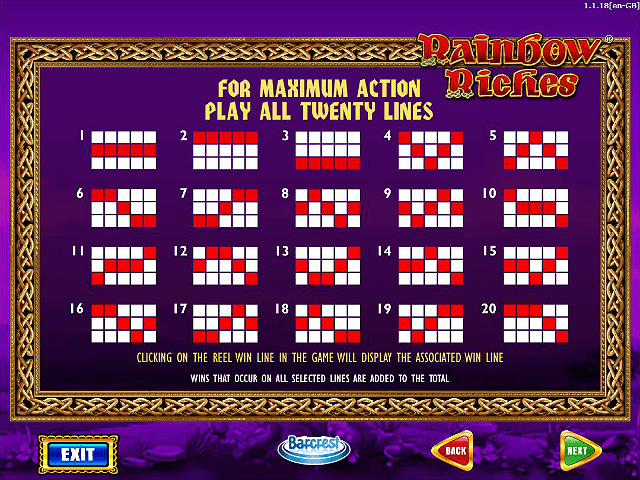 The Rainbow Riches slot game does not feature an autoplay option. Let’s take a look at those special symbols. The wild substitutes for all other game icons (except the other specials), and this means you can create winning lines where they otherwise don’t exist. 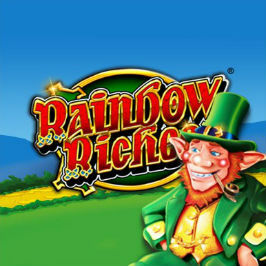 There are three bonus features in the Rainbow Riches slot, and the first is triggered by the leprechaun avatar. This is the Road to Riches feature, and what a journey to profit this could be. Three or more leprechauns trigger the feature, and a graphic of a path will appear. Spin the wheel and see how many steps along the path you take – you could finish on a collect square or make it to the end of the road. You'll win the amount displayed multiplied by your stake, with a maximum of 500-times available. As you'd expect, the wishing well icon triggers the Wishing Well feature. This is the most straightforward of the bonus rounds, where you select one of the wells to reveal the amount your stake will be multiplied by. Again, a top prize of 500-times your money is there for the taking. Finally, the Pots of Gold feature is awarded courtesy of the same symbol on reels two, three and four. Now gold and silver pots will revolve on screen, and once these settle into place you'll see how much you have won. Guess what? A top prize of 500-times your stake is available. So, give the reels a spin and find out what's really at the end of that rainbow. Share this Rainbow Riches Review today! 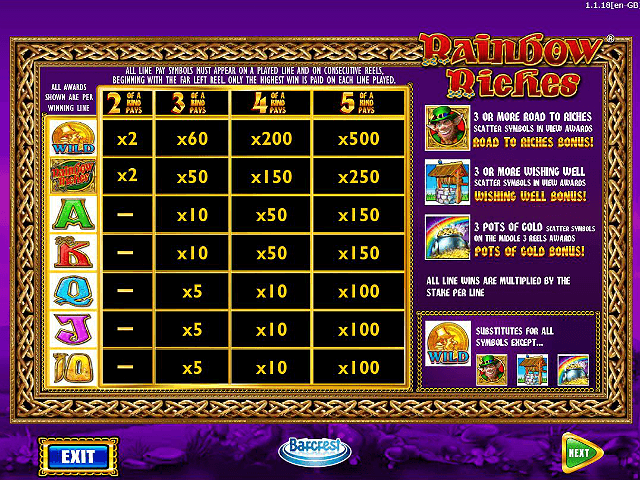 If you like Rainbow Riches, you'll love these slot titles too!